Here's a reality about the nature of vinyl records: As the stylus runs through the grooves of the record, static electricity is generated. This static electricity attracts dust and debris to the record. The moisture in the air, mixed with oils on your hand when you handle the record mix with the dust and debris, and stick to the record. As the stylus runs through the record grooves, this gunk gets stuck to the stylus (needle). Over time, you'll begin to notice that the records you play on your turntable begin to sound less clear, distorted, staticy, just plain different. You can clean your records all you want, but the sound is still "off". Get some cleaner specially designed for turntable styluses, as well as a stylus brush. Apply a drop or two of the cleaner to the brush. Hold the tone arm and stylus firmly with your hand to ensure that it doesn't move and turn on the turntable while you're cleaning. Rub the brush from the rear of the stylus to the front. Repeat this a few times: 5-10 should be great. Let the stylus air dry for about 5 minutes. 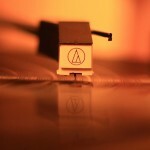 Place your favorite record on the turntable, and enjoy the (clear) music! That's it, folks. Easy enough, and it can make a significant difference in the quality of the sound. There are no real guidelines to how often you should do this. Fanatics will say do it after every session, but I think it's only necessary about once every 15-20 hours of record playing. I just came across this article. I’ve been using my turntable for about a year straight now, though I don’t listen to it VERY often, I feel that it’s about time for some maintenance. I wasn’t aware that the needle should be cleaned so frequently. I’ve heard you can clean it with a q-tip and rubbing alcohol. However, I’m afraid I might damage the needle. So I don’t know what to do. I have nothing to clean it with besides that. Hopefully it won’t damage the needle. Despite the tip being made of diamond, the rest of the cantilever is some sort of metal, I’m sure. So it must be sensitive to moisture and water. Hence the use of alcohol, I’m sure. I’m sure you can clean it with alcohol and a q-tip, just be very careful. The main concern is not damaging the tiny piece of metal that holds the tip of the stylus. Always clean the tip by moving from back to front, be gentle, and you should be fine. I read the info about cleaning a needle great info. Maybe you can help me I am looking for a needle for a 1970 Concert Hall Record Player it is a small portable childs record Player Do you know where I may find one or more ??? Glad you liked the post. I don’t know how much luck you’d have finding a replacement for a portable child’s record player. You could try getting in touch with the manufacturer…if they still exist. I have been using a high end turntable/stylus for many years and never “wet clean” my stylus, you can use a very fine grade sandpaper about 320 grade or finer, it wont harm any gem tipped styli. Use from rear to front and dont forget to turn the volume right down first. Thanks for the tip! I’ve never heard of using sandpaper before, so thanks for sharing your technique. I had to replace my stylus’s recently because I was DJing and caught my shirt as I was moving the turntable around afterward. I went and picked up a pair of Stanton 520.V3’s at a local shop. Take care of your stylus, and your stylus will take care of you. I have been using a Q-tip and 91% alcohol for years with no trouble (I also use that to clean my tape heads). Just be very gentle and careful when cleaning and you should be fine. I’d start with Google and see if you can find contact information for the manufacturer. If not, see if you can find a parts distributor that carries that brand. I have a Fisher Studio Standard turn table model MT 855 and the turntable sounds like it should be spinning but it doesn’t. Do you think there is something wrong with a belt? When using a q-tip, wouldn’t there be concern about getting cotton lint on the needle? ?